REDWOOD CITY, CA (October 10, 2018) —According to a new report from Equilar, Board Composition and Director Recruiting Trends, which featured commentary from Georgeson, KPMG’s Board Leadership Center and Semler Brossy Consulting Group, the percentage of women on boards is continuing to increase. 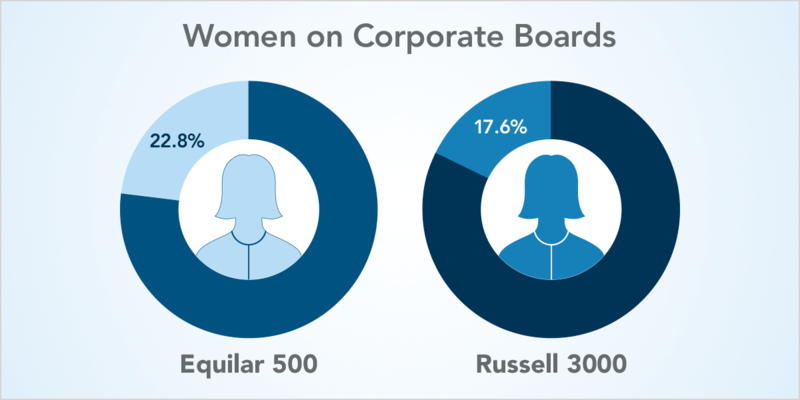 Women now represent 22.8% of Equilar 500 directors and 17.6% of Russell 3000 directors. Over the last year, gender diversity has become an area of focus across corporate America. California recently passed a law that will require public companies headquartered in California to have a minimum of one female on its board of directors by December 31, 2019. That minimum will be raised to at least two female board members for companies with five directors or at least three female board members for companies with six or more directors by December 31, 2021. High profile investors, such as BlackRock and State Street, are also continuing to play an integral role in not only promoting diversity on boards, but other areas of concern with regard to composition. Another interesting trend uncovered in the report revealed that more companies are disclosing a mandatory retirement age for directors. From 2014 to 2018, the number of mandatory retirement age disclosures has increased steadily by 8.8 percentage points and 3.6 percentage points in the Equilar 500 and Russell 3000, respectively. Currently, 42.1% of Equilar 500 boards and 20.4% of Russell 3000 boards have a mandatory retirement age. As board refreshment continues to be a point of focus for investors, this trend shouldn’t come as a surprise. The percentage of women in board leadership positions has declined by 10.1% at Equilar 500 companies from 2017 to 2018, sitting at 7.1%. However, female leadership has risen slightly, from 5.8% to 6.1%, at Russell 3000 companies over that same time frame. On average, the prevalence of Equilar 500 directors with CEO experience has increased by about 0.6 percentage points each year from 2014 to 2018. To request a full copy of the report, click here. Board Composition and Director Recruiting Trends, an Equilar publication, analyzes boards of directors as disclosed in annual proxy statements (DEF 14A) or amended 10-K filings (10-K/A) of the Equilar 500 and Russell 3000 companies over the last five years. Years are defined by fiscal year end dates between April 1st and March 31st. The Equilar 500 consists of the 500 largest, by reported revenue, U.S. headquartered companies trading on one of the major U.S. stock exchanges (NYSE, Nasdaq or NYSE MKT (formerly AMEX)), adjusted to approximate the industry sector mix of similar large-cap indices. The report identifies particular trends in the composition and disclosure of public company boards.